When do politics become history? At what point do historians take over from journalists and propagandists in telling the human story? This is not a purely subjective or arbitrary point. For example, there is a broad consensus that the fall of the Berlin Wall (1989) and the subsequent collapse of the Soviet Union marked the end of an era, an era ushered in by the assassination of Archduke Ferdinand in Sarajevo in 1914 (Eric Hobsbawm’s ‘short twentieth century’). 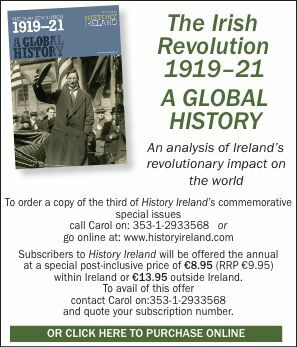 In relation to Ireland the cynic might answer ‘never’—the ongoing Peter Hart/Tom Barry controversy in the pages of this magazine being a case in point (see pp 12–17). Cynicism aside, there are similar, broadly accepted watersheds in Ireland’s history—the Act of Union, the Famine, 1916 or, more whimsically, Ray Haughton’s goal against England in June 1988, which some say ushered in the Celtic Tiger. Does the recent IRA statement, promising the complete decommissioning of their weapons and the end of all paramilitary activity ‘whatsoever’, represent such a shift? Unionist sceptics have pointed out, somewhat pedantically, that the IRA has called off the ‘campaign’ but not the ‘war’, just as they did in 1923 and 1962. But if the recent statement does represent the end of an era, when did it begin? August 1969? 1920 (partition)? 1858 (Irish Republican Brotherhood)? 1791 (United Irishmen)? While the description ‘Irish Republican Army’ did not become common currency until the War of Independence, the organisation was founded in November 1913 as the Irish Volunteers (Óglaigh na hÉireann) in order to defend Home Rule against the armed blackmail of the Ulster Volunteer Force, set up the previous January—with the connivance of the British Tory establishment—in defiance of the ‘mother of parliaments’. What was this but a declaration of war, against not only Irish democracy but British as well, and from which has flowed all our subsequent troubles? Let us hope that that era—of the use or threat of violence—has truly come to an end.